TWAN is a global program of Astronomers Without Borders (www.astrowb.org) and a Special Project of International Year of Astronomy 2009, an initiative by IAU and UNESCO. The World at Night is to produce and present a collection of stunning photographs of the world's most beautiful and historic sites against the nighttime backdrop of stars, planets and celestial events. The eternally peaceful sky looks the same above all symbols of different nations and regions, attesting to the truly unified nature of Earth as a planet rather than an amalgam of human-designated territories. Read about astronomy. Merely looking up in the sky will not teach you all you need to know, so visit your local library and browse through the astronomy section. There is a variety of books which are geared toward beginners as well as the more advanced. Find one that is an introduction to astronomy, and learn about the physics of the cosmos. Surf the Internet under 'Astronomy' and be assured you will receive a vast array of information as well as pictures. Find someplace dark to observe that is away from city glare. Good choices might include national and state parks. Enquire at these places about naturalist lead presentations about the night sky as well. Use your eyes. It is not necessary to buy an expensive telescope because the naked eye can see a great deal in the night sky. By observing with only your eyes you get a true feeling of how ancient astronomers practiced their craft. If you can, try to lie down on the grass and look at the sky above you. The darkened sky takes on another dimension in this position, and creates a feeling of you being totally alone in a vast universe. Locate the North Star, and follow the 'map of the sky'. Make sure you have the correct star map to coincide with the date and location. If you have studied the books, you might be able to find the "Little Dipper" and other constellations or asterisms. Join an astronomy club. Amateur astronomy is very popular in most cities and small towns. Search the Internet to find a club in your vicinity or get information by calling a local planetarium. Clubs give you the opportunity to learn from others who have more experience, and to meet and make new friends with other beginners who have the same interest in astronomy. From the History's Channel "The Universe" series, season one; "Beyond The Big Bang". Neil deGrasse Tyson explains the connections we all have, with Sagan-like poetry. Neil deGrasse Tyson is a leading astrophysicist, the director of the American Museum of Natural History's Hayden Planetarium, a columnist for Natural History Magazine, and the author or coauthor of six books. Can you imagine living in this region of space? Just think of the beautiful views you'd have in the sky – that is, if you survived the chaos as one galaxy is passing through the core of three other galaxies at ridiculous (ludicrous?) speeds (3.2 million km per hour / 2 million miles per hour) generating a shock wave of gas and X-rays. This is Stephen's Quintet, A compact group of galaxies, discovered about 130 years ago, located about 280 million light years from Earth. The curved, light blue ridge running down the center of the image shows X-ray data from the Chandra X-ray Observatory. The galaxy in the middle, NGC 7318b is passing through the core of the other galaxies at high speed and is thought to be causing the ridge of X-ray emission by generating a shock wave that heats the gas. The most prominent galaxy in front (NGC 7320) is actually far away from the other galaxies and is not part of the group. Additional heating by supernova explosions and stellar winds has also probably taken place in Stephan's Quintet. A larger halo of X-ray emission – not shown here – detected by ESA's XMM-Newton could be evidence of shock-heating by previous collisions between galaxies in this group. Some of the X-ray emission is likely also caused by binary systems containing massive stars that are losing material to neutron stars or black holes. Be on the lookout for unusual – and beautiful – noctilucent clouds that are invading the North American and Europe. SpaceWeather.com says that these mysterious "night shining" clouds are on the increase. Some scientists think they're seeded by space dust. Others suspect they're a telltale sign of global warming. Whatever the reason, they are an amazing site, appearing around sunset. Mike Hollingshead took this gorgeous image on July 14 near Blair, Nebraska USA. "I've never seen noctilucent clouds before, even though I am often out looking," he said. "These were wonderful." Stu took his NLC images (see more on his website Cumbrian Sky) in mid-June near historic Kendal Castle in the UK (one of Henry the 8th's wives lived there, Stu says). SpaceWeather.com has a great gallery of NLCs, which also includes observing tips. The site says reports of these clouds are pouring in from Oregon, Washington, Idaho, South Dakota, central California and possibly northern Nevada. These sightings are significant because they come from places so far south. When noctilucent clouds first appeared in the late 19th century, they were confined to latitudes above 50 degrees N (usually far above). The latitude of Blair, Nebraska, is only 41°30' N. (Cumbria in the UK is about 54 degrees N.) No one knows why NLCs are expanding their range in this way; it's one of many unanswered questions about the mysterious clouds. Find out more about NLCs here. When and where will NLC show up next? "No idea," said Stu. "We can’t predict them in advance. They just… appear. All we can do is keep looking, on every clear night, just in case. We do know that this summer is expected to be a very good one for NLC-spotting because they appear more at “solar minimum”, and we’re in a deep, deep minimum now, so all we can do is keep an eye on the sky, and cross our fingers!" There are a few nebulae that can be seen with the naked eye and many more that can be detected with a good pair of binoculars. A telescope is required to bring our fine details. Unfortunately, the human eye is not sensitive enough to bring out the rich colors of most nebulae. It is the photograph that does the most justice to these incredible objects. Until recently, time exposures on film were the best way to bring a nebula's true colors. Today, digital photography has simplified the process. New tools like the Hubble space telescope are giving us views of nebulae that have never been seen before. Areas of active star formation have been identified in many galaxies that were once thought to be inert. Perhaps the most well known nebulae is the Orion Nebula, also known as M42. It is one of the very few that can be seen with the naked eye. It is a bright emission nebula over 30 light-years in diameter. The nebula is illuminated by a group of stars at its center known as the trapezium. Another popular favorite is the Lagoon Nebula, M8. It is much larger than the Orion Nebula, reaching over 150 light-years across the heavens. The Trifid Nebula, M20, is one of the most colorful. This reflection nebula contains a combination of elements that render it in rich hues of red, blue, and pink. Dark lanes of dust divide it into three distinct parts, giving rise to its name. One of the most famous planetary nebulae is the Ring Nebula, M57. This is a beautiful object that resembles a circular rainbow around a small central star. Another popular planetary nebula is the Dumbbell Nebula, M27. Its unmistakable bow tie shape gives it its name. The Crab Nebula, M1, is probably the best known supernova remnant. It is a shell of gas expelled by a supernova explosion. The nebula is illuminated by the 16th magnitude star remnant at its center. The Hubble space telescope has captured some breathtaking images of nebulae from all parts of the galaxy. We may think our Sun is impressive, but it pales in significance when compared to the red supergiant Antares which burns more than 600 light years away. In this stunning image Antares glows orange and is surrounded by reflected bright yellow gas and dust. It is considered a bruiser in the Milky Way, with a diameter 800 times that of our Sun and a luminosity which is 10,000 times brighter. Antarres is the crowning star in the Rho Ophiuchus Nebulae Complex, considered by many astro-photographers to be the most beautiful area of the night sky. The complex features stunning nebulae, which are huge clouds of interstellar gas and dust. A yellow reflection nebula surrounds Antares and the red areas of this image are created by hydrogen gas in red nebulae emitting light. 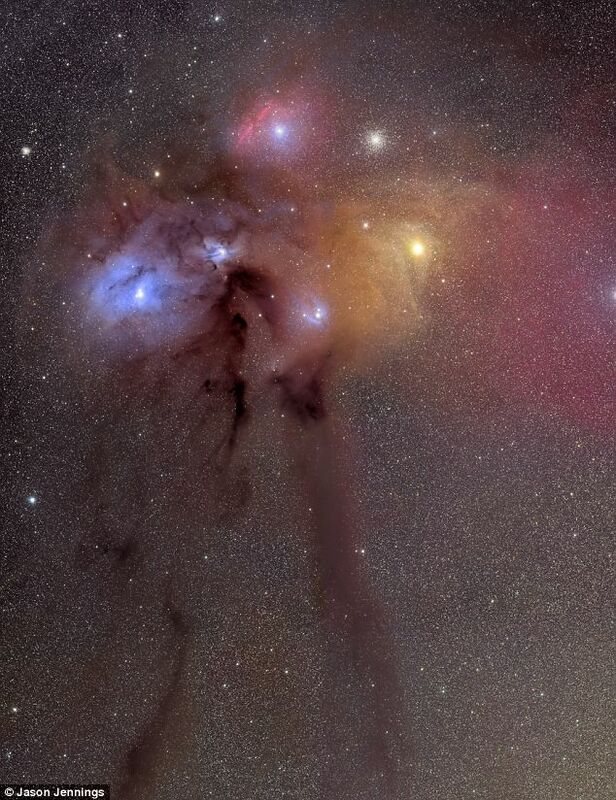 To the left of the picture a sensational blue reflection nebula surrounds the Rho Ophiuchi triple star and is a result of interstellar dust that is illuminated by nearby stars. It also contains dark nebulae in strange murky shapes such as the ‘pipe nebula,’ which appears upside down to the left of Antares, and the ‘Dark River’ that flows down towards the bottom of the picture. Made up of hydrogen gas and thick dust clouds they hide background stars from view. While the ‘Dark River’ is 500 light years away, the globular star cluster M4 (seen shining white above Antarres) is a whopping 7,000 light years from Earth. One of the largest such clusters in our galaxy,it is made up of more than 10,000 stars. The colourful skyscape is a mosaic of eight panels spanning nearly 10 degrees across the sky. It is found in the constellation of Scorpius, which can be seen in the southern sky close to the horizon if you live in the Northern hemisphere. It was captured over three months by Australian astro-photographer Jason Jennings on four different days. He had an exposure time of 16 hours with two hours per panel and used a £5,400 astronomy camera built for wide field space imaging. Deployed by the space shuttle on 23 July 1999, the Chandra telescope is Nasa's flagship mission exploring the realms of X-ray astronomy. The observatory, which is named after the Indian-American astronomer Subrahmanyan Chandrasekhar, orbits the Earth once every 64 hours. Here, Darren Baskill, an X-ray astronomer at the University of Sussex, explains Chandra's importance, and looks at some of the colourful images it has produced in the past 10 years.